Professor Steve Joordens of the psychology department at the University of Toronto Scarborough has been awarded a University of Toronto President’s Teaching Award. Joordens is one of five new recipients and the only UTSC winner for 2010. The award entitles recipients to membership in the University of Toronto’s Teaching Academy. The other honorees are Professors Robert Brym of sociology, Paul Stevens of the English department, Michael Wiley from the faculty of medicine's department of surgery, and Senior Lecturer Barbara Murck from the University of Toronto Mississauga's geography department. The recipients were chosen by a committee chaired by the provost, and their appointments to the Teaching Academy were approved by U of T’s academic board. The new slate of winners represents the fifth class of outstanding teachers to receive the awards, which were first announced in 2006. The recipients will each receive a stipend of $10,000 a year for five years to further their work, and as automatic members of the Academy, they will be called upon periodically to discuss teaching-related matters and to advise the vice-president and provost and the Centre for Teaching Support and Innovation. They may also be asked to deliver an annual public lecture or a convocation address. 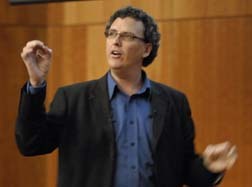 With a number of students working with Joordens on pedagogical research, including Dwayne Pare, Lisa-Marie Collimore, Tim Cheng and Ada Le, he says the funds will allow his team to present their work at a variety of conferences and support research that they might not otherwise be able to pursue. “Given that our work is primarily focused on how to use technology to enhance learning, students at UTSC and beyond will benefit,” says Joordens. Since joining UTSC in 1995, Joordens has taught seven undergraduate courses and three graduate courses, creating five of them from scratch. He has won various awards in recognition of his teaching ability, including the Scarborough Campus Students' Union Best Professor award and four nominations for TVO's Best Lecturer competition. In addition, he won a provincial Leadership in Faculty Teaching (LIFT) Award in recognition of both his lecturing and his innovative approach to education. His interest in learning technologies was also honoured in 2009 when he, along with his graduate student Dwayne Pare, won a 2009 National Technology Innovation Award for their creation of peerScholar, an Internet-based application that supports the development of critical thinking and clear communication skills.